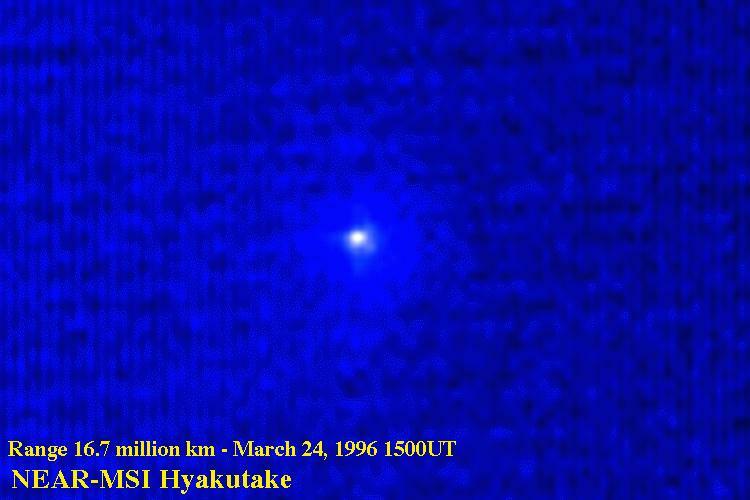 First imageis a false-color image of Comet Hyakutake (C/1996 B2) taken by the Multispectral Imager (MSI) on the NEAR spacecraft on 24 March 1996. The image was obtained 36 days after launch as part of the MSI and spacecraft early cruise calibration. At this time, NEAR was 16.7 million km from the comet and 15.3 million km from the Earth. NEAR was actually 1.5 million km farther from the comet than was the Earth because it is on an outbound trajectory for an encounter with the asteroid 433 Eros in 1999. The image is a composite of two frames taken through the clear filter with 1 second exposures. The field of view is a full MSI frame: 2.5 by 2.25 degrees. The inner coma of the comet is visible, as are a number of stars ranging from magnitude 5.1 to 8.2 (star names, magnitudes, and spectral types are listed). The comet is centered in the image, demonstrating the ability of the spacecraft to point accurately at a moving target and to slew from position to position in the sky using its onboard software. 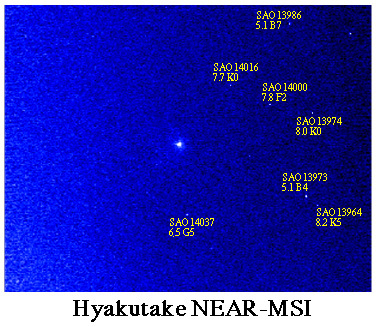 Second image is an enlarged view of the central region of an image of Comet Hyakutake (C/1996 B2) taken by the Multispectral Imager (MSI) on the NEAR spacecraft on 24 March 1996. The colors are false and are designed simply to bring out contrast. NEAR was 16.7 million km from the comet and 15.3 million km from the Earth at this time. The image spans 1 degree of sky and the coma spans about 3 arcmin. Because of the large distance to the comet and the limited exposure time of the MSI, the signal from the comet is at best only a few percent above the background level. (The design of MSI is optimized to obtain images while orbiting close to the asteroid 433 Eros.) Nonetheless, the central coma can be seen generally to be symmetric in this image, although there is some evidence for coma structure. The Sun is to the right. The image was taken through the clear filter and is a composite of two 1-second exposures.